Riding a wave of popularity from a recent face-off with Pakistan, Indian Prime Minister Narendra Modi has launched his party’s general election campaign with the promise of a “new India”. The 68-year-old pledged economic growth and a prosperous society for all at three rallies in northern India, attended by tens of thousands of supporters, on Thursday. 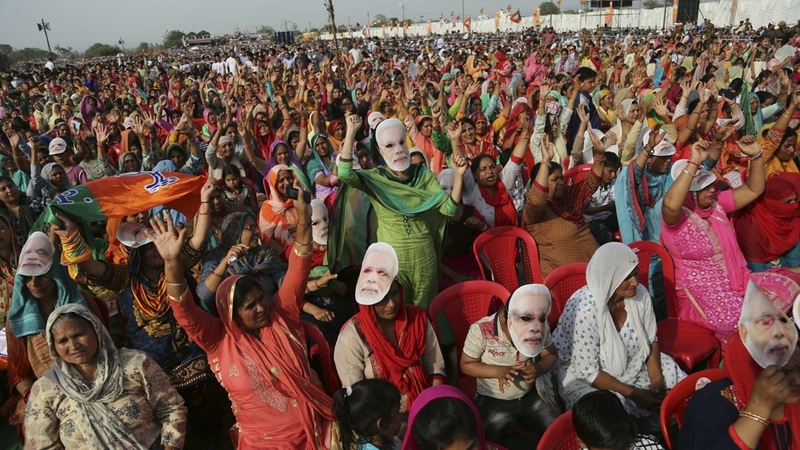 “This country has seen governments that only made slogans, but for the first time, they are seeing a decisive government that knows how to demonstrate its resolve,” Modi said at one event in Meerut City, Uttar Pradesh state. “Our vision is of a new India that will be in tune with its glorious past … India’s 1.3 billion people have already made up their minds. Once again, a Modi government is going to be formed in this country,” he told the crowd, who, cheering and waving BJP flags, chanted for another term for Modi. The ruling coalition led by Modi’s Hindu-nationalist Bharatiya Janata Party (BJP) is widely expected to retain power in the staggered election beginning on April 11. Some 900 million people are eligible to vote in the ballot, which is considered the world’s biggest democratic exercise. The vote will be held in phases ending on May 19 and ballots will be counted on May 23. A recent escalation in tensions between India and its neighbour and rival Pakistan is expected to boost the BJP’s chances of re-election. A February poll by the Times of India said that 83 percent of more than 2,000 respondents said they would want the coalition to choose Modi as prime minister if they maintain a majority. Tensions soared last month after a suicide attack in Indian-administered Kashmir killed more than 40 members of India’s security forces. Shortly after the attack, a video of the bomber emerged in which he swore allegiance to Pakistan-based armed group Jaish-e-Muhammad (JeM). India retaliated with an air raid against a suspected training camp in northern Pakistan. A village in Akhnoor, part of the disputed Jammu and Kashmir state, was the site of one of Thursday’s rallies. The rallies come a day after India destroyed a low-orbiting satellite using a ballistic missile, a military feat only equalled by China, Russia and the United States, which Modi said puts India in the space “super league”. “[Be it] land, sky or space, my government has shown courage to conduct surgical strikes in all spheres,” he said. Supporters of Modi took to social media to congratulate the government on the latest feat, but his opponents criticised the timing of the announcement in the middle of election campaigning. Powerful opposition leader, Mamata Banerjee, called it a gross violation of the electoral code of conduct. Modi’s economic record has also come under steady attack from a resurgent opposition, while the BJP’s main rival, the Congress party, which had dominated Indian politics for decades, has accused the prime minister of stoking nationalist fervour to curry votes. 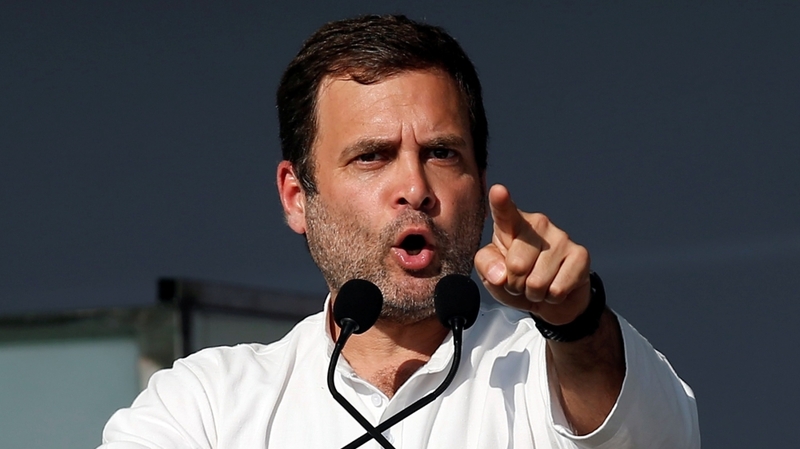 Congress party leader Rahul Gandhi – the scion of India’s unofficial First Family – has relentlessly attacked Modi for failing to fulfil his 2014 election promises, pointing to rising unemployment and farmer suicides. Gandhi has offered 50 million of India’s poorest families – an estimated 250 million people – a guaranteed basic income of $1,000 a year, if he wins power on May 23. The BJP dismissed the plan as unrealistic, but some pollsters say the handouts could win votes. Bhawesh Jha, founder of CNX, one of India’s largest polling companies, estimated that many voters in relatively poor and populous states – Rajasthan, Chhattisgarh and Madhya Pradesh – where Congress won power in local elections late last year, could be swayed by the handouts.